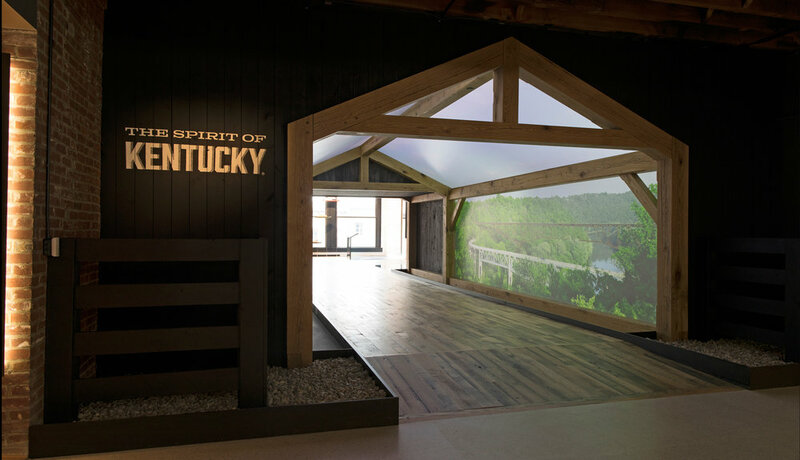 For an in-depth look at Bourbon whiskey, The Spirit of Kentucky® is the place to begin! A covered bridge-style path leads into the exhibit, which is located on the third floor of the museum. 4K footage of Cumberland Falls and Red River Gorge is projected on the interior of the bridge, simulating the sights and sounds of Kentucky's breathtaking landscapes and wilderness. A sunlit room at the end of the bridge pays tribute to the physical features of Kentucky. The theme is "Enchanted," and the content is organized around the elements of nature that lend themselves to Bourbon-making: water, limestone, soil, crops and wood. Maps in the "Water" section chart the forks and creeks of Kentucky's river system. Model riverboats mounted on the wall capture different stages in the history of shipbuilding, from a flatboat and a steamboat to a diesel-powered barge. 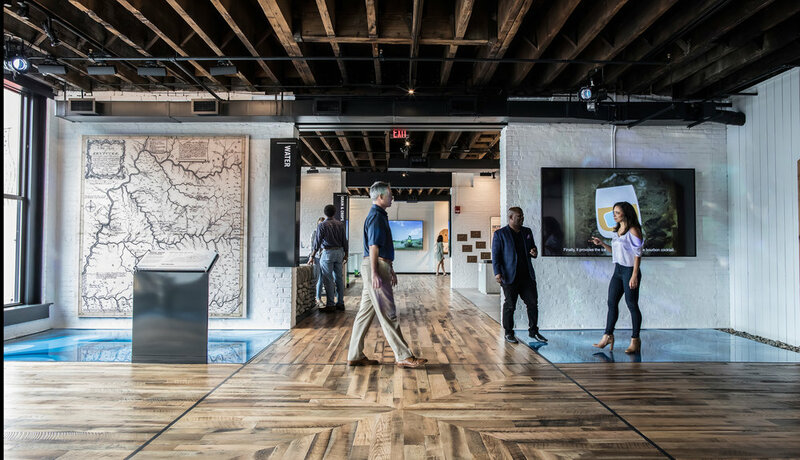 These artifacts and maps work together to illuminate the logistics of shipping Bourbon, a product that emerged at a time when waterways were the arteries of interstate commerce. Today those waterways are one of the two key features of Kentucky's water: above ground, the water forms a network of rivers that facilitate trade; below ground, it percolates in aquifers that give it a pleasant taste. A short video on a nearby monitor traces that pleasant taste back to the Paleozoic era. The video notes that long ago, ancient marine animals fossilized into the shelf of limestone that sits below the soil in present-day Kentucky, filtering iron out of the water while depositing minerals that make it taste sweet. A rubbing station in the "Limestone and Soil" section uses horses to illustrate the effects of this filter: visitors are invited to make crayon-on-paper rubbings with figurines of Derby-winning thoroughbreds. Since the grass that the horses eat is brimming with calcium-rich groundwater, their strong bones are a testament to the limestone. Artifacts in "Crops and Grains" pertain to the corn, rye, malted barley and wheat grains that are stored in silos outside of Bourbon distilleries. A mix of these grains is what eventually gets milled and boiled into a porridge-like mash, then fermented and distilled to make a clear whiskey which, the moment it touches oak, becomes Bourbon. A section labeled "Farming, Then and Now" takes a look at the past and the present of grain farming practices: on one side is a sculpture made of antique tools and farm equipment; on the other is a selection of cutting-edge gadgets that modern farmers use to measure and forecast the weather. At a cooperage table in the "Wood" section visitors get to simulate doing the work of a cooper. Once white oak lumber is air-dried and milled, the staves are toasted, bent and "raised" to make a barrel, then charred with a gas-fired burner. The char produced is crucial to the quality of the Bourbon: as whiskey ages in that barrel, it will expand and contract with the seasons, repeatedly penetrating the wood and retreating to the barrel with flavors — and color — lifted from the red layer of char. A Sensory Experience station in the "Wood" section offers samples of four aromas found in Bourbon that derive from this process: caramel, vanilla, charred oak and lactone. Portraits of early Bourbon barons line the walls of the “Gracious” room, a space dedicated to the friendly, collaborative nature of the Bourbon industry. A large family dinner table beside a mantel is the focal point of the room. Known as the "Gracious Table," it contains a voluminous digital library of Bourbon-related research. 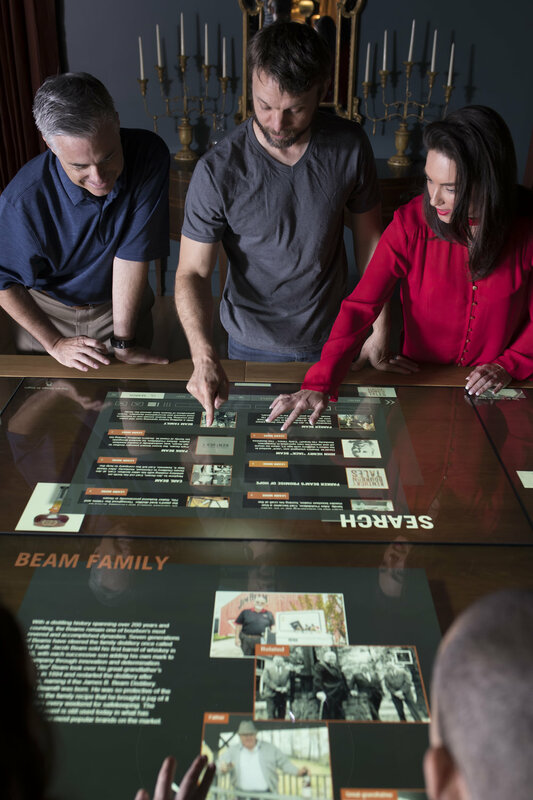 This content can be accessed on the table's interactive surface: as clickable icons flow gently across the screen, visitors can tap them to unlock different entries. Each entry consists of a text caption paired with a visual media file — for example, a photograph, a lithographed map, a vintage postcard or an interview segment. If a visitor wants to research a distillery that closed at Prohibition, she can open a fire insurance map of the property, c. 1894 or 1910, and zoom in: the text on the map contains details about the distillery, including its registration number, founders and proprietors, storage and mashing capacities, heating and drainage patterns, etc. If she wants to learn about jobs in the whiskey business, she can watch clips of interviews with seasoned veterans of the industry — people whose occupations have included brand ambassador, Master Distiller, plant operator, quality manager, bottling technician, barrel roller, beer chemist and tour guide, among other things. Hundreds of entries populate the "Gracious Table" library, which will continue to be expanded going forward. The goal is to catalog all the people, places, things and events that have played a significant role in the history of Bourbon: the major brands, distilleries, distillers and owners; the original founding families and Bourbon Barons; and the mixologists responsible for popular cocktails. Other entries will include game-changing technologies and product developments; marketing campaigns and celebrity endorsements; TV, film and pop culture appearances; laws, regulations and taxes; myths, legends and stories; facts, statistics and trivia; and more. From the “Gracious” room visitors pass through a copper portal into the “Refined” area. 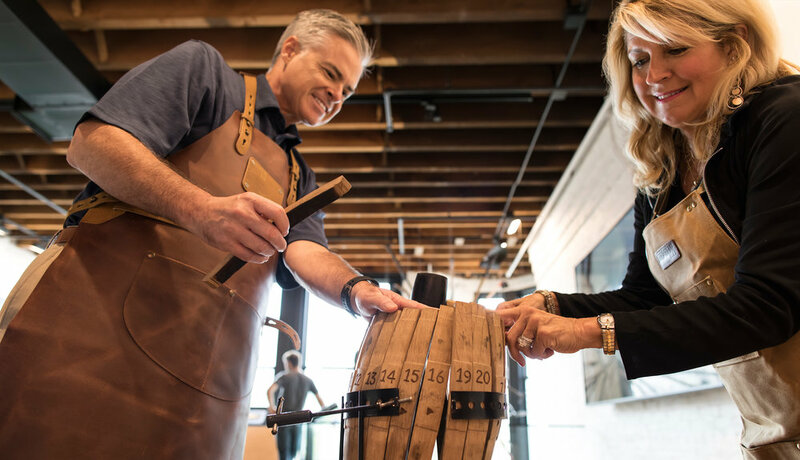 This space celebrates the artistry and craftsmanship at the heart of the Kentucky Bourbon industry, as well as the culture of responsibility that it promotes. 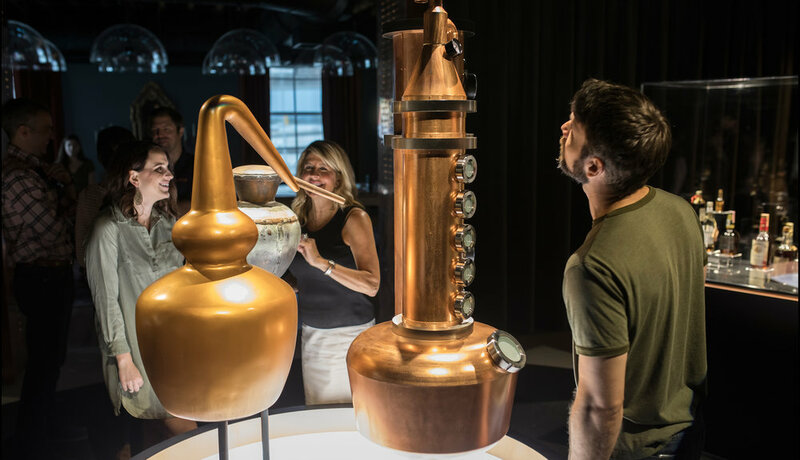 An "Evolution of the Still" display consisting of a pot still, a column still and a hybrid still occupies the center of the room. Glass cases around it contain a lineup of rare and vintage whiskeys. 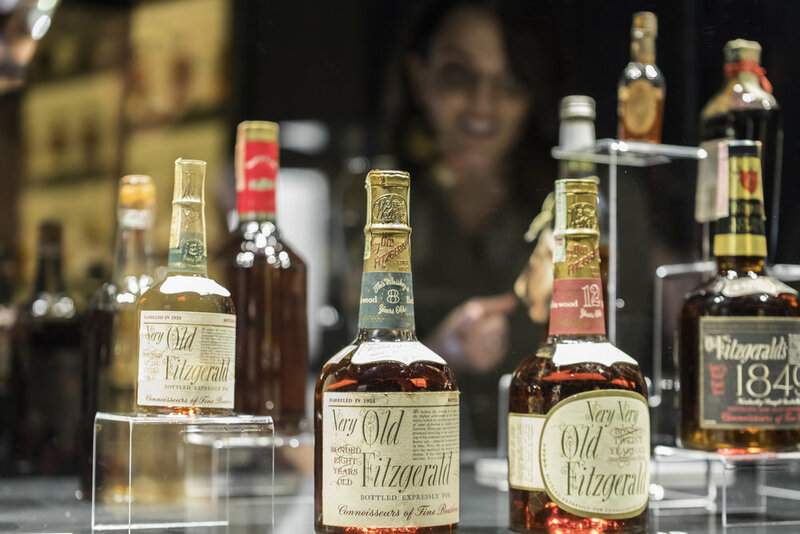 Visitors can exit the exhibit from this room by passing through the "Bottle Hall," a corridor stocked with every brand of Bourbon currently produced in the state of Kentucky — a massive collection of over 500 bottles! Kentucky Bourbon Trail® and Kentucky Distillers’ Association® are registered trademarks of the Kentucky Distillers' Association used pursuant to license.